Hit like a truck and outlast any opponent! 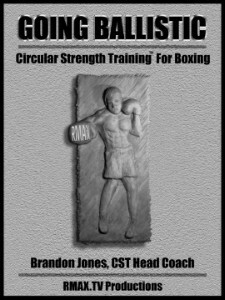 Developed by Head Coach Brandon Jones, a veteran boxer and martial arts instructor, the Going Ballistic: Circular Strength Training for Boxing Manual represents a sophisticated new approach to fight preparation. Breaking with tradition, this manual does away with many time-honored boxing myths and habits while presenting a comprehensive explanation of training secrets for practitioners of the "Sweet Science" and other combat sports. Be the best-prepared fighter in the ring! Due to its demanding and sophisticated nature, advanced skill with Clubbells is strongly recommended for practice of the Going Ballistic program. Familiarity with the complete RMAX Performance Enhancement Library will greatly assist your practice.